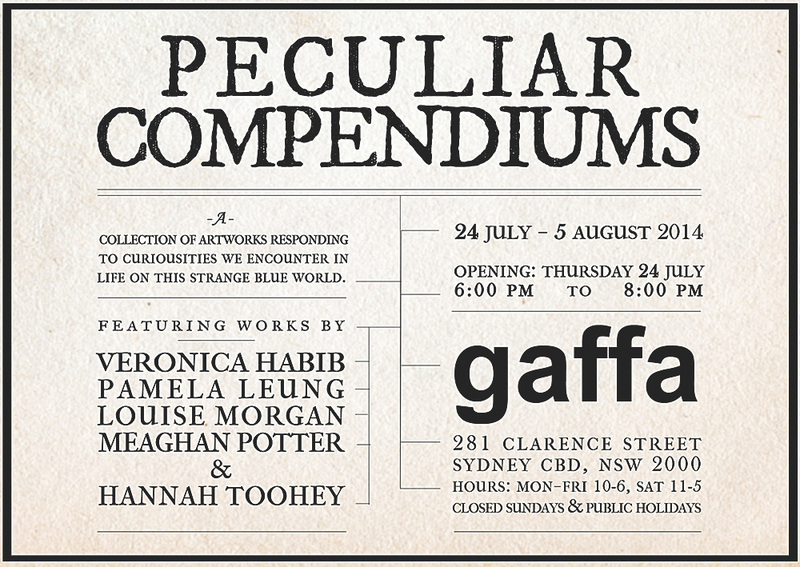 I'm really chuffed about this group exhibition: Peculiar Compendiums at Gaffa. Peculiar Compendiums is a collective meditation on the peculiarities and oddities which enrich our existence on this strange blue planet. Drawing inspiration from natural history and anthropological studies, the individual works aim to ignite an array of emotions and reactions, evoking a sense of wonder and intrigue similar to 18th century cabinets of curiosity, with a contemporary twist. The contributing artists have engaged with themes ranging from social behaviour and our changing engagement with the physicality of the human body to meditations on the unexpected encounters of the everyday, whilst others chose to explore the mysterious phenomena of the natural world and sinister aggregations of unclear origin. Through the diverse disciplines of installation, sculpture and drawing, Peculiar Compendiums brings together a collection of works, which themselves become exquisite specimens of the human experience. Opening Night: 6 - 8 PM Thursday 24 July, 2014 | Event page here.